NAIROBI, Kenya, February 22, 2012 (ENS) – Environment ministers from around the world ended their annual meeting today by promising to make the upcoming UN Conference on Sustainable Development, Rio+20, a success. 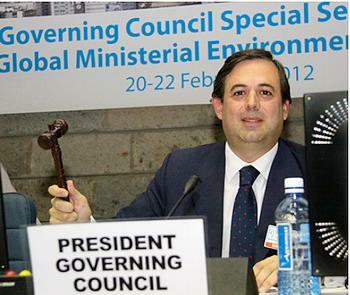 The ministers and representatives from nearly 150 countries were attending the 40th anniversary United Nations Environment Programme Governing Council and Global Ministerial Environment Forum, which opened Monday at UNEP Headquarters in Nairobi. The ministers said many of the environmental challenges glimpsed 20 years ago at the landmark Rio Earth Summit in 1992 are today’s reality – climate change, the loss of biodiversity and fisheries, deforestation and the decline in productive and healthy soils. Three weeks in advance of the Rio+20 conference, on June 5, Brazil will host the UN’s annual World Environment Day. This year’s theme, “Green Economy: Does it include you?” invites everyone to assess where the Green Economy fits into their daily lives and evaluate whether development towards a Green Economy can deliver the kinds of social, economic and environmental outcomes needed in a world of seven billion people. Brazil also hosted World Environment Day in 1992, on the eve of the first Earth Summit in Rio de Janeiro. “In celebrating World Environment Day in Brazil in 2012, we are returning to the roots of contemporary sustainable development in order to forge a new path that reflects the realities but also the opportunities of a new century,” said UNEP Executive Director Achim Steiner. “We are very pleased to host this global celebration for the environment. The World Environment Day will be a great opportunity in Brazil to showcase the environmental aspects of sustainable development in the warm-up to the Rio+20 conference,” said Brazil’s Environment Minister Izabella Teixeira at the Governing Council meeting. During their three-day meeting, the environment ministers focused on the twin themes of Rio+20 – a Green Economy and an institutional framework for sustainable development. In addition to the challenges of financing, capacity and access to relevant technologies for developing countries, Ramos de Armas noted concerns by some countries that a Green Economy might lead to trade protectionism. “Many of the activities under the Green Economy approach can provide new opportunities for women to become key players in the local economy, especially in the energy, land management and water sectors,” said Ramos de Armas. There was a high level of support among the ministers for strengthening UNEP’s mandate, authority and financial resources. Over 100 countries, including members of the African Union and the European Union, have backed the upgrading of UNEP to a specialized agency of the United Nations as one of the Rio+20 outcomes. Delegates supported greater involvement of major groups and stakeholders in any new institutional arrangements, including local and regional authorities, women, indigenous peoples, young people and the private sector. Chantal-Line Carpentier of the UN Department of Economic and Social Affairs saidd that out of over 686 submissions received on the “zero draft” of the Rio+20 outcome document, 493 were from major groups. She identified priority areas as: energy access, efficiency and sustainability; food security and sustainable agriculture; green jobs and social inclusion; sustainable water management; urbanization; oceans; and improved resilience and disaster preparedness. 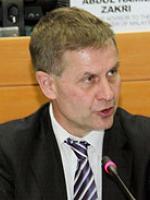 But time to make key changes is running out, Ramos de Armas said in his closing address to the Governing Council. 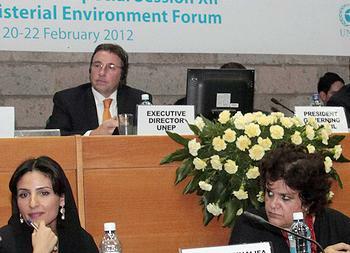 Current and former UNEP Executive Directors at UNEP’s 40th anniversary Governing Council meeting, from left: Achim Steiner (2006-present) ; Mostafa Tolba (1975-1992); Elizabeth Dowdeswell (1992-1998) and Klaus Töpfer (1998-2006) . As a tangible recognition of UNEP’s mandate and achievements, the government of Norway has committed NOK 200 million (US$35 million) for the period 2012-2013. This contribution is in addition to Norway’s annual support to the core funding of UNEP and its support to key programs such as Reducing Emissions from Deforestation and Degradation in Developing Countries, REDD. Norway has doubled its support to the UNEP-UNDP Poverty and Environment Initiative to meet the increased demand from developing countries for advice on the integration of environmental concerns into national development policies. Norwegian Environment Minister Erik Solheim emphasized UNEP’s role within the UN system of integrating environment and development. The GEO-5 Summary for Policy Makers was negotiated and endorsed at an intergovernmental consultation in South Korea in late January. 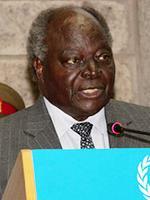 It was launched Monday at the UNEP Governing Council Special Session.